There are four major trends that will continue to impact healthcare revenue cycle management industry in the future. Through this major structural transition, the decision makers in healthcare revenue cycle management industry need to craft procedures that will enable the organizations to remain financially strong. Healthcare finance executives view complex revenue cycle management systems as the best way to increase efficiency and improve patient care. A switch from paper records to electronic ones simply cannot happen overnight. Most organizations need to broaden their technological wagon to manifest greater returns from the healthcare revenue cycle management industry. Hospitals and other healthcare organizations need to streamline suitable CAC (computer-assisted coding) tools which will help them mitigate some financial risks. For instance, ZirMed Inc., a renowned company in predictive analytics and cloud-based revenue cycle software development launched the Coverage Detection solution in April 2017. This RCM solution helps the healthcare provider to recover the revenue from self-pay patients. The ZirMeds software delivers a success rate of 5% to 15%, which is much above the hit rate of manual methods. This considerably higher percentage of self-pay is likely to translate into thousands of dollars’ earnings for the organization. The shift from fee-for-service to value-based care in healthcare revenue cycle management industry certainly warrants attention. Healthcare providers over the past few years have begun to move toward a patient-centric system to improve the quality of healthcare and patient satisfaction. The emerging value-based care model is engineered to enhance healthcare services while reducing costs. Now, this may pose a real challenge to the healthcare providers as they are being asked to deliver better for less money. Despite this, the healthcare industry is likely to adopt value-based care to replace the old model in which patients were billed for services including examinations and medical procedures. The trend today is to create a transparent and efficient service that helps patients manage their health efficiently. As the value-based model in healthcare revenue cycle management industry gains traction, RCM companies are expected to embrace customer relationship management (CRM) as a lucrative marketing tool, which is estimated to keep the revenue stream healthy. Precision medicine. Revenue integrity. Predictive analytics. Population health management. Big data has changed the face of healthcare industry in nearly all aspects. Moreover, surge in healthcare spending in countries such as U.S., will benefit the RCM industry growth. According to CMS, U.S. is anticipated to grow at a CAGR of 5.6% every year from 2016-2025. 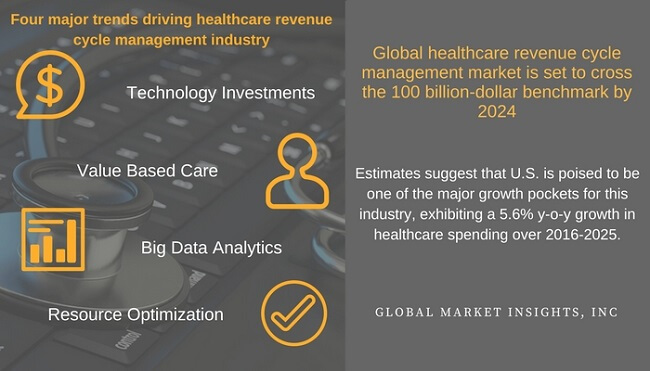 Healthcare revenue cycle management market will witness a spur, as the integration of digital signage, artificial intelligence and health analytics will begin unlocking its potential. This industry is expected to unleash tremendous value as the healthcare system removes the structural barriers to data access and sharing. Better and specifically targeted data in healthcare revenue cycle management industry will fuel the overall productivity and efficiency of the system. The key deployment models in healthcare revenue cycle management industry are on-premise and cloud-based. Cloud-based solutions have gained prominence over the former as they are relatively less expensive and provide better IT support. Cloud-based healthcare RCM industry is projected to witness a major boost, with the target market size slated to surpass USD 80 billion by 2024. As technology will continue to assist in managing and processing data, healthcare cloud computing market will grow at a rate of 20% over the period of 2016-2023. The Vice President of Healthcare Applications for Dimensional Insights, George Dealy, shares his viewpoint on the trend of data analytics, where he states that healthcare organizations need to start leveraging on data insights in their current revenue cycles. Over the years, it will become even more critical to translate the rich information into actionable RCM developments at a practical level. He also added that early adoption of HRCM will help in providing better information and strategic business decisions in the future. With the evolving transit to value-based care, the desire to reduce waste will further propel healthcare revenue cycle management market. Efficient billing and error reduction will eventually save the organization’s finances. VocalRX, a call center software company for healthcare IT successfully reduced the time spent on tasks including insurance denial notifications, bill balances and lab test results notifications. The use of RCM models has helped the company cut down up to 40% of their staffing needs. This depicts that hospitals actually prefer eliminating such operations that require hours of manual data entry and the ones which are prone to errors, to reduce the wastage of time and money. As the healthcare industry is rapidly evolving into a customer-centric market, the companies in HRCM industry are also changing their approach to help healthcare providers improve their financial standing. Expansion of the healthcare revenue cycle management market will provide better access to medical organizations and reduce their complexities. As RCM models become a vital part of business, many big organizations will also prefer outsourcing their financial accounts to companies in HRCM industry. The major players operating in healthcare revenue cycle management industry need to identify where to invest for strategic product differentiation and how to create highly-targeted business plans for the future. Global Market Insights, Inc. has a report titled “Healthcare Revenue Cycle Management Market Size By Product (Integrated, Standalone), By Deployment (On-Premise, Cloud Based), By Component (Services, Software), By End User (Hospitals, Physicians, Diagnostic & Ambulatory Care Centers), Industry Analysis Report, Regional Outlook (U.S., Canada, Germany, UK, France, Spain, Italy, China, India, Japan, Brazil, Mexico, South Africa, Saudi Arabia), Growth Potential, Competitive Market Share & Forecast, 2016 - 2024” available at https://www.gminsights.com/industry-analysis/healthcare-revenue-cycle-management-market .